The JDL-S6-2 is an extremely popular light that is seen in most undercover or volunteer. 12 3rd Generation LEDs give this light the visibilty seen for a long ways. Durable, dust and moisture resistance, comes with a button on the side to give you 19 different flash patterns and you can't beat the price. Ready for you to custom order today. 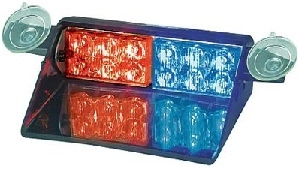 Specifications: Power: 12/24V DC Lights: 12 3rd Generation LEDs Flash Pattern: 19 Mounting: Suctions cups ADDITIONAL OPTIONS: Order your colors below.